Almost 6 years ago I was being induced in labor room 8 at Boca Raton Regional Hospital with my first child Kate. After about 15 hours of failure to progress, I was brought into Operating Room #1 and my first daughter was born there via cesarean delivery. Despite the fact that I have worked in almost every single labor and delivery room at this particular hospital over my 4 year career as a labor and delivery photographer, it has been almost 6 years since I have been in this specific LD room. Labor Room #8 at Boca Regional. On September 23rd, 2018, I never expected that my client in labor with baby girl #3 who was attempting a TOLAC and hoping for a vaginal delivery after two prior c-section births, would have a similar story to experience. 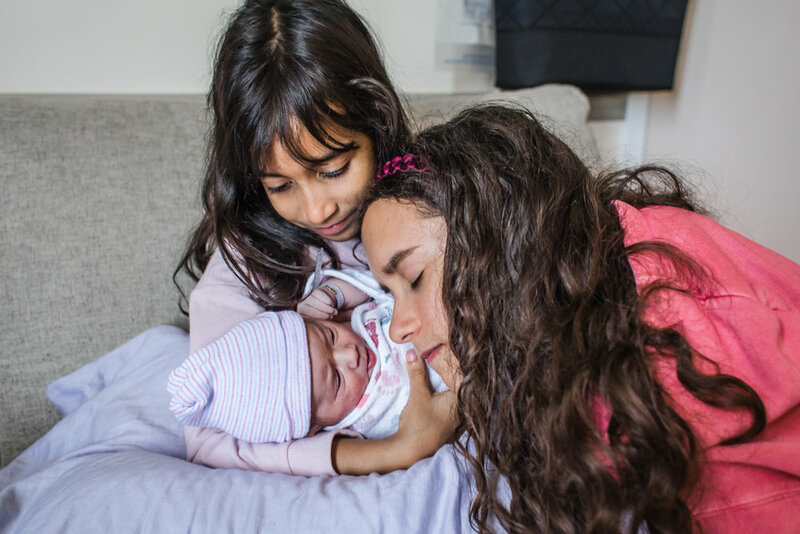 My birth client hired midwives Polina Goldenberg and Courtney McMillian at Boca Midwifery for the birth of her third baby. Her previous two daughters were born via cesarean section and she was hoping for a vaginal delivery with baby #3. Mama headed into Boca Regional on a Sunday early morning at 4:05am since her labor started. Around 8:45am, I was already visiting a Fresh 48 session client at the same hospital in post partum who had a cesarean birth the night before, who actually told me that they bumped into each other in triage, so once I was done capturing my client’s older children meeting their 3rd child for the first time, I joined her in LD room 8 around 9:30am. I stayed with them for a little while and took some photos of her in early labor. Mama labored through some pretty intense contractions for a while. 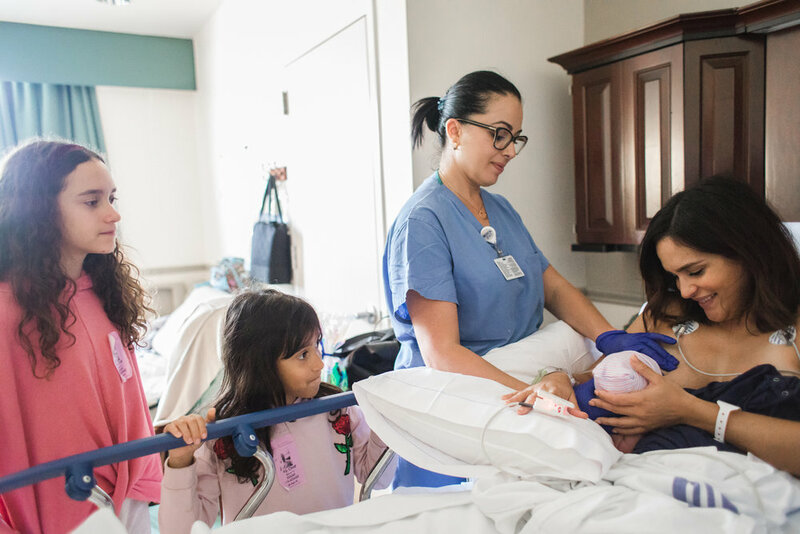 She walked the halls of the hospital with her midwife Polina and her daughters to help things progress and squatted and leaned against the hospital rails to get more productive contractions. At around 2:30pm, I was back in my office when I received the update that mama started getting a little nervous during the latest more intense contractions. She started feeling a pulling and stretching sensation around her previous c-section incision site. Her midwife and the back up OBGYN Dr. David Lubetkin, who was overseeing the labor (a doctor who backs up a CNM Midwife for VBAC must be present in the hospital from the moment a vbac patient is in the hospital in labor until delivery in case an emergency c-section must be performed) both felt it could be scar tissue stretching during contractions due to the two previous c-sections, but with mama being so nervous, no one wanted to take the chance, not even mama. So we prepared for the operating room. 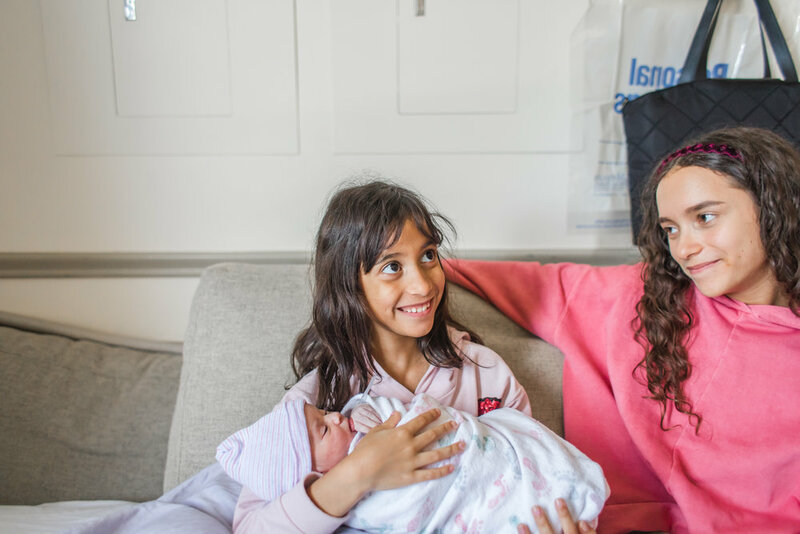 Since contractions hadn’t become so intense that mama felt she needed her labor doula with her before, we called her and asked her to come to hang out with mama’s older daughters while we would be in the operating room. Pictured below is one of my favorite labor doulas in south Florida, Lisa Raynor, hugging mama just before we headed into surgery. Sometimes moms ask me what happens with their doula support if they need a c-section. The answer is — sometimes mom wants their doula to join us in the operating room, to help talk them through the process, to reassure them that everything they are feeling, both emotionally and physically during the entire process is normal and safe, to be there in support of their partner or spouse and reassure them whether all is going well, and sometimes, staying behind with your older children is just what you may need your doula to do. When I went in for my repeat cesarean with my second baby, I asked for my doula to come to the hospital and stay with my 3 year old while I was in the operating room. It really made me feel very reassured she was with a person I could trust to keep her safe and preoccupied, so she wouldn’t be sad, scared or missing me while I was in surgery. As we walked back to the operating room, mama had to pause a few times as she continued to have contractions. 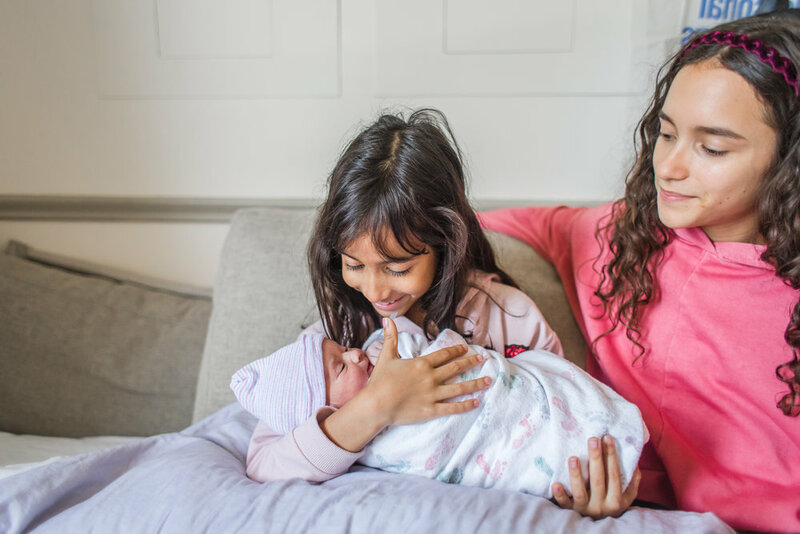 When you spontaneously go into labor before a c-section, you continue to feel contractions until you have received either an epidural or spinal with anesthesia that blocks the sensation of intense contracting of your uterus. This mama took every single wave and surge like a laboring goddess. I was so in awe of her. She really struck such an emotional nerve with me. 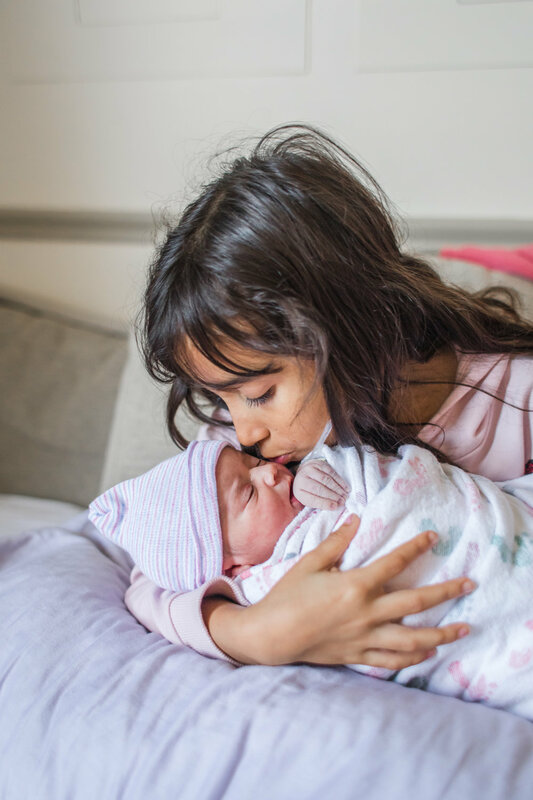 I don’t know if it was because she is also a girl mom just like me, and I’ve secretly always dreamed of having three daughters, or if it was the linearity of the event — girl mom, using my favorite midwives for her birth, same hospital as my first, same labor room, same operating room. Maybe it was everything all at once. But I felt such a protective instinct over this mama. Almost like I had to be her big sister in these moments. And here is where I step back in, feeling so humbled & honored that this beautiful couple and family would trust me with this very tremendous moment and story. How I wish there could have been someone to capture these moments of our story with our daughters. Everything I do a birth photographer, I do with the intention of capturing every single moment I never got to have on camera from my two births. A lot of moms ask me what happens if they have to have a c-section, who will be with them in the operating room. 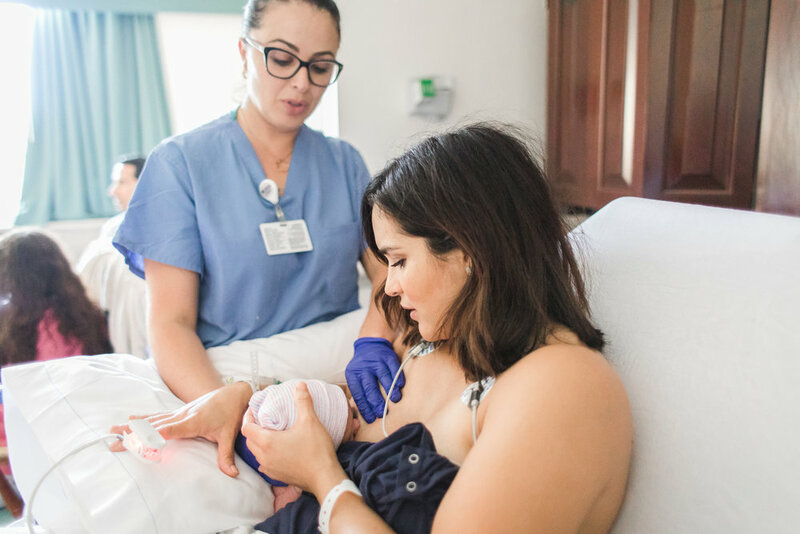 While I don’t know what happens at other hospitals, at Boca Regional, the hospital is a huge proponent of moms being fully supported. 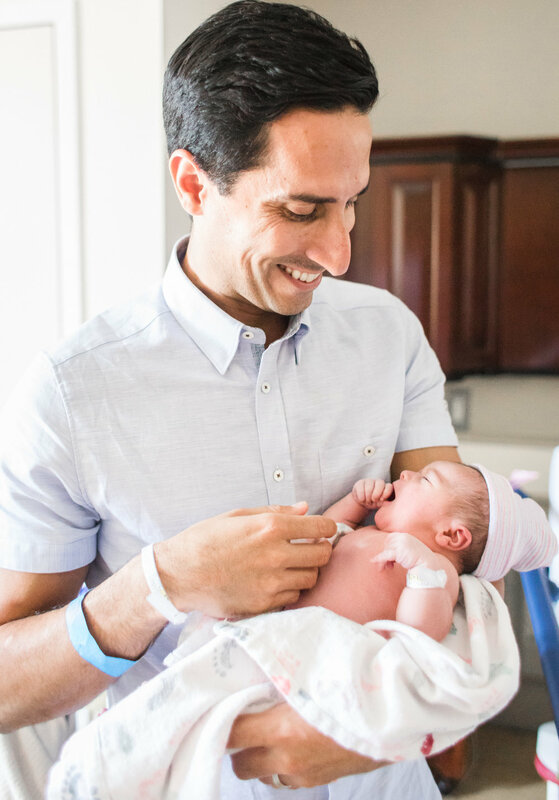 Every unexpected c/section delivery where the mom was originally with a midwife, continues to be accompanied by the midwife through the entire delivery even if in the Operating Room. This is HUGE to psychological health for moms during the partum partum period. 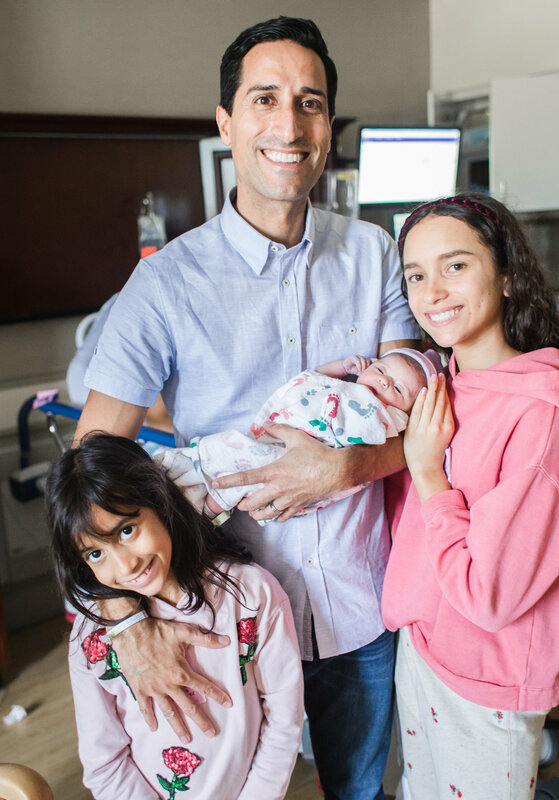 After baby girl was born into the hands of Dr. Lubetkin and midwife Polina, the doctor did see that the stretching/pulling sensations mama was getting during contractions and labor was indeed from a lot of scar tissue surrounding her previous two csection incision site. It was however a relief to hear it was not a uterine rupture. And from this moment of the first meeting, all the emotions that came flooding after, the story that unfolded, was the most beautiful, most healing experience of my life. Seeing a mother SO supported and surrounded by so much love during a cesarean birth was so heart fulfilling. Then the following meeting story will completely melt your heart. 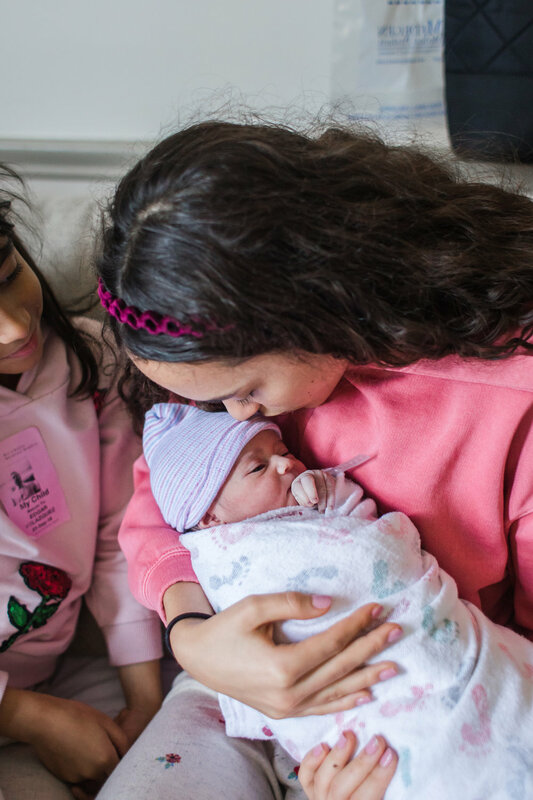 As soon as baby girl was born, and mama was brought back to her labor room, both big sisters were waiting with doula Lisa Raynor ready to meet this sweet princess. This was also my first time in the last 4 years that my ovaries really started aching, I started picturing myself as a mama of three. 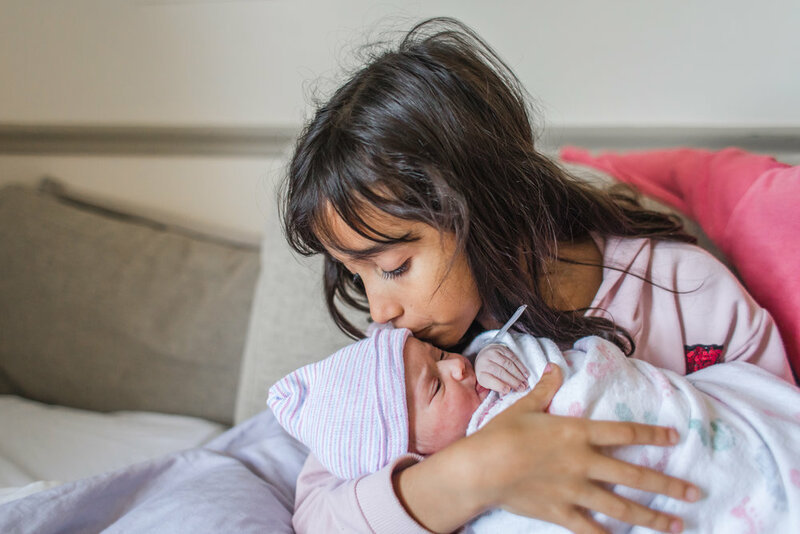 I didn’t even care if my third birth would be a vba2c or a third repeat csection, as long as it would be with this birth team, at this hospital, and with both of my daughters at the hospital immediately to meet their baby, I kind of really wanted it in a heart beat. My ovaries ache just thinking about it. My ovaries ache just writing it right now! Baby fever is so contagious! And this birth story and meeting story is completely intoxicating. At least for me. My hubby better be careful, haha! Dad’s Face as he sees their “baby” meeting the new baby!